This is a shawl I made for my friend Koni to wear on the cooler days they get in Texas. I called Sunday Comfort Shawl as she likes relaxing on a Sunday morning with a cup of coffee and the news papers. A simple pattern that knits up quickly and can be done whilst watching the TV. I used 40cm long 6mm needles with DK yarn. I chose Peacock blue, Green and Lilac yarn as they were the colours my friend likes. Repeat this row until you have enough stitches to make it as wide and as long as you want. My needle was so full of stitches it could not hold any more. I changed colours on the RS and decided how many rows to add between each colour. Mine was 11 garter ridges in Turquise blue 1 or 2 garter ridges in Lilac and 4 ridges garter stitch in green. 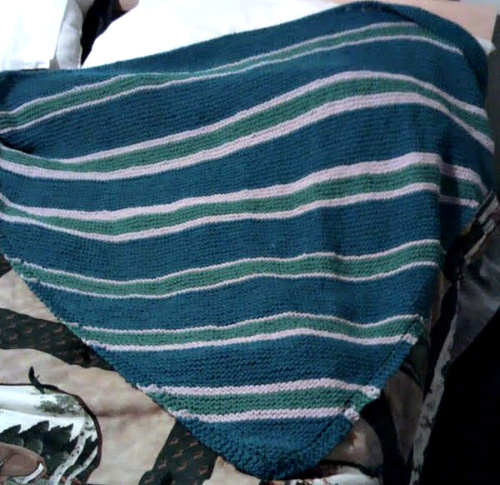 Bind off when the shawl is as large as you want it. A nice easy shawl that can be knitted in various yarns just use a needle one or two times larger than stated for the yarn. A shawl made in varigated yarn would be pretty as well.